Just enter your email in the box on the right, and follow the link they will send you. I’d really appreciate it if you came over to the new site, lots of posts coming your way after a lot of behind the scenes work on the blog- and an exciting summer of adventures and posts ahead! I found myself in London recently. 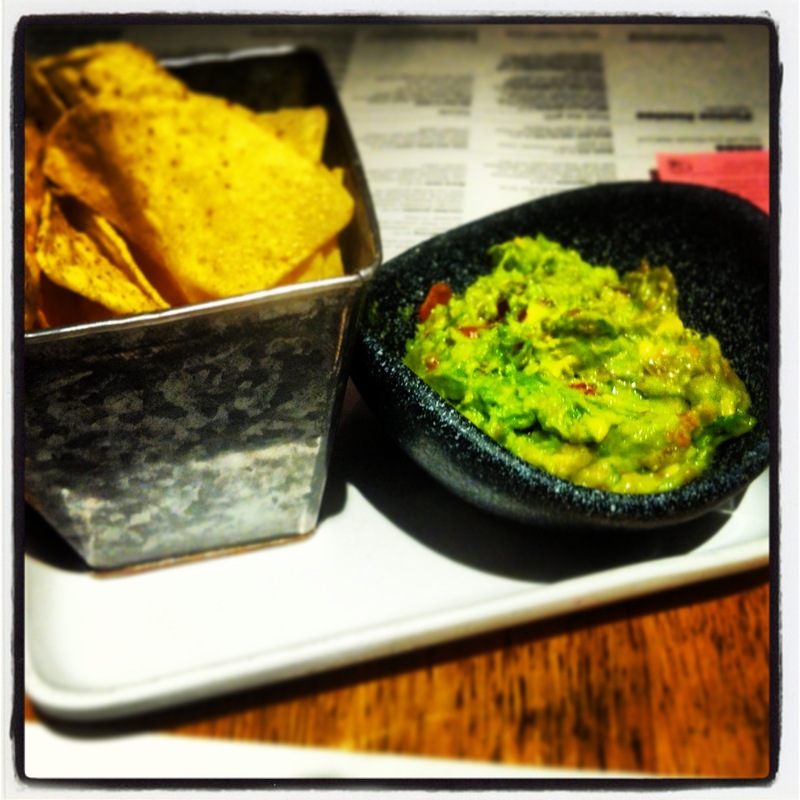 One recommendation that came through on twitter and from friends over and over was Wahaca. So I made sure I tried it for dinner one of the night’s on my trip. I met with a friend from college, who had never eaten with a food blogger before. She did very well, and waited for photos of the food to be taken before going near anything. We arrived not long after 6, and there was already a wait for tables. We used this time to grab a refreshing beverage- and soon our buzzer was going telling us that the table was ready. We ordered some guacamole and chips while we perused the menu. The guacamole was very pleasant. It had some coriander and wasn’t too heavy-handed on the red onion. Very tasty. I left most of the ordering in my friend’s hands, having been before but my influence did extend to the pork pibil, which was first to arrive. 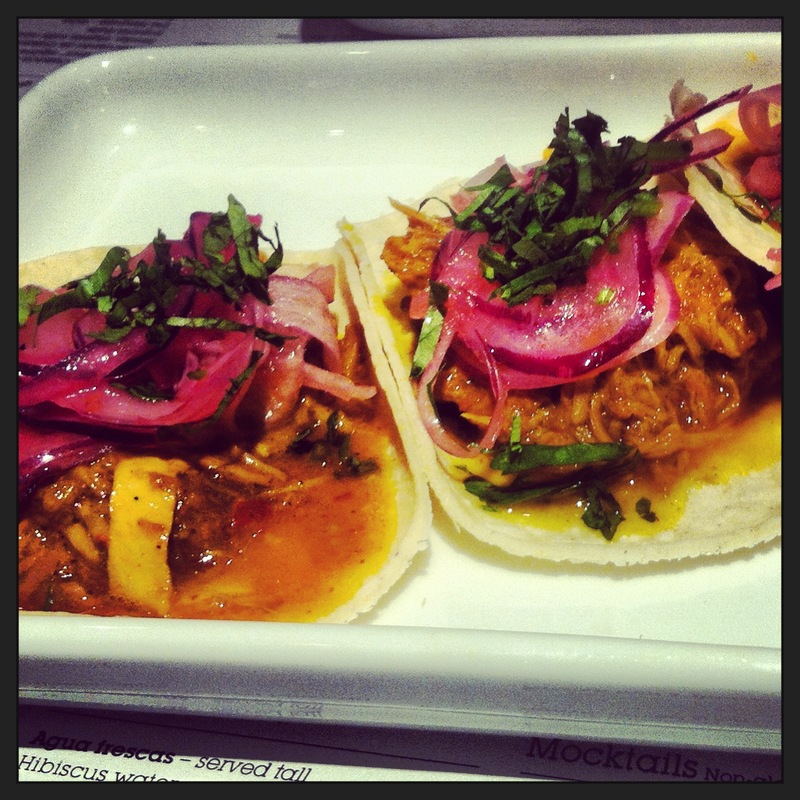 Tender marinated pork, served on soft tortillas, garnished with some pickled onions. It was very tasty but perhaps it lacked a little punch. This may have been due to the heat coming from my beer– which owing to a slight mix up in ordering, was served with chilli and all sorts of other stuff. Interesting and quite spicy. There was a herring tostada which was sour and a little bit smokey. Delicious. We went for both the taquitos on the menu, the winner here was the sweet potato and feta one. A triumphant combination of sweet and salty. There was also a very flavoursome mushroom quesadilla, which had an earthy taste. All of this was rounded off with a split order of churros, doused in cinnamon and sugar. Tip (from my mate): order a side of dulce de leche with the chocolate it comes with. Pretty tasty combo. Service throughout was helpful (for us first timers), not rushed and very friendly. In short, the food’s very good, it’s great value and it is a fun place for some casual dining and a few drinks. I just hope they don’t over-extend as they are expanding at quite a rate. 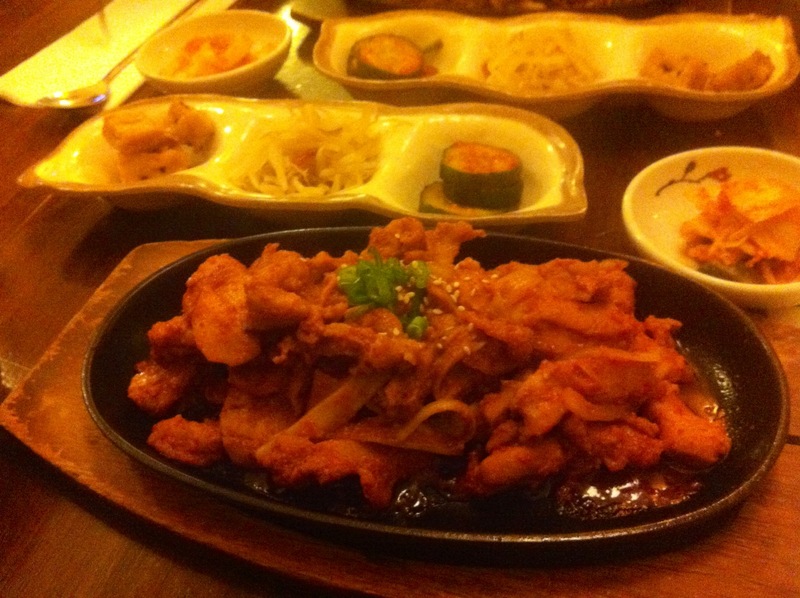 As the review tab of the blog will tell you, I’m working my way through Dublin 1’s Asian eateries. Having spent a considerable amount of time in the north inner city in years gone by, it is thoroughly refreshing to see it with a new lease of life and this is something I never tire of. I had heard good things about Kimchi and having not eaten much Korean food before/the prospect of pickled vegetables featuring heavily- I was eager to try it. Myself and a friend arrived to a fairly busy restaurant for midweek and took our seats. It is an interesting set up. There are Korean bits of artwork on the wall and a few of these proved to be somewhat unsettling to my dining companion. We started with four chicken dumplings which were very tasty. Crisp and with a delicate interior, they were heavily flavoured and we were just sorry there weren’t a few more on the plate. I opted for Dakgalbi. Pan fried chicken, in a chilli sauce. It was served with three ‘side dishes’ and some cabbage kimchi as well as some steamed rice. The side dishes consisted of some fried tofu, pickled bean sprouts and pickled cucumber. The cucumber was by far the best, providing a sharp bite of contrast to the chicken. The sprouts didn’t benefit from whatever treatment they had received and myself and tofu had a falling out some years ago, and any hope of a rekindling of that relationship is unfortunately misplaced. I enjoyed the dish, but it was a little one-dimensional after a while. The other main at the table was Bulgogi, which thanks to a helpful asterisk on the menu informed us it was a signature dish. It was a dish of thinly sliced beef, and had a nice flavour (soy sauce and Korean seasoning.) My partner in dining felt it lacked any wow factor, and wasn’t sure the side dishes were in any way connected to it. With 2 beers and some basic service the bill came to €42 ish. Kimchi is not bad, but nothing special. The Morrison Hotel on Ormond Quay reopened earlier this year after a fairly extensive refurbishment. I was only ever in its previous incarnation once before owing largely to my tender age at the time. It’s very different now. With the hotel’s refurbishment has come the Morrison Grill. I was invited along to sample some of their dishes with some other bloggers. And their cocktail menu was given a slight workout too. Pre-dinner cocktail in Quay 14. It was a bleak, sleety evening and after a chilling Dublin bike ride down the quays, the evening kicked off enjoying the surrounds of Quay 14. After a restorative cocktail, or two, we got to sample some of the morsels pictured below. The deep fried olives were something I had never tried before. They were all sorts of fried, salty goodness. 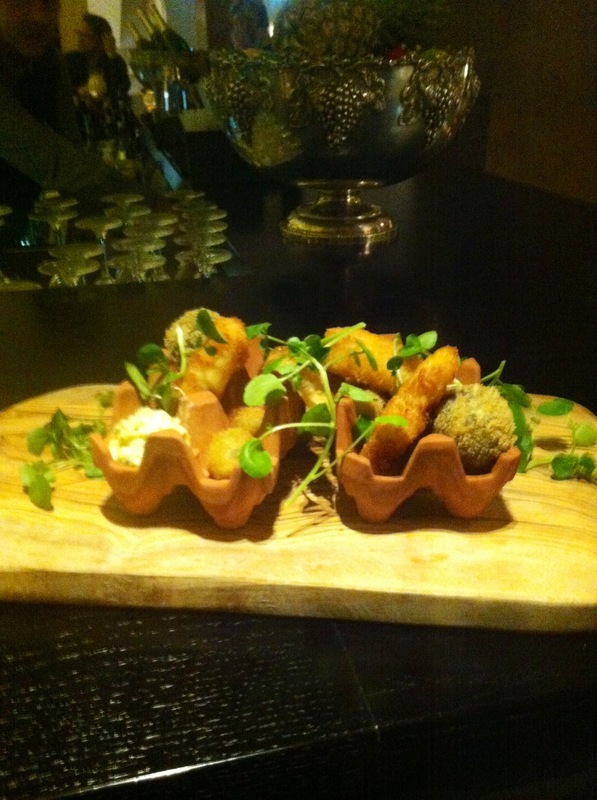 We got to sample a range of starters from the kitchen, headed up by John O’Leary. I loved the mussels and cured salmon. 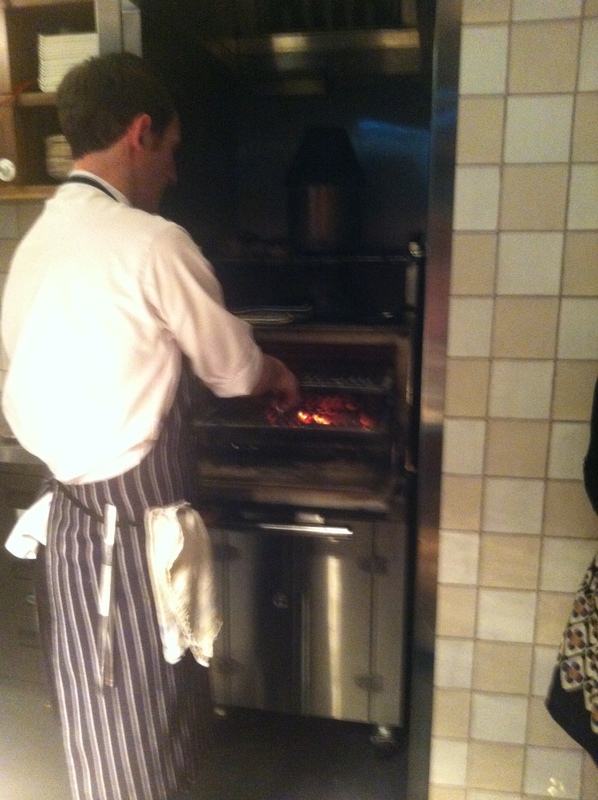 The centerpiece of the menu (literally) is their Josper charcoal grill. This is an interesting piece of kit that is fired by charcoal and air and can burn at temperatures of up to 500 degrees Celsius. Toasty like. A grill like this needs to be road-tested with a decent hunk of meat, so I went for the beef rump steak. It was cooked perfectly (medium-rare, if you’re asking). The fries it was served with were a triumph. I normally despise chunky chips. However these ‘sumo’ fries were delicious. I’d say there is methodology behind their cooking. For dessert the kitchen again sent out a selection of what was on offer. While the smoked applewood honeycomb was very different and a new one for this seasoned gob, the star of the show was the lemon tart with rose-water sorbet. It was just deadly. End of. If you haven’t been in since it reopened, pop your head in. The bar and dining space are very pleasant arenas to pass a few hours and the care and attention for the food and cocktails is evident. Over the next few weeks there are going to be one or two posts about restaurants in Doha. There won’t be too many I promise. I know the taxi fare from Dublin to there makes a meal out prohibitively expensive. 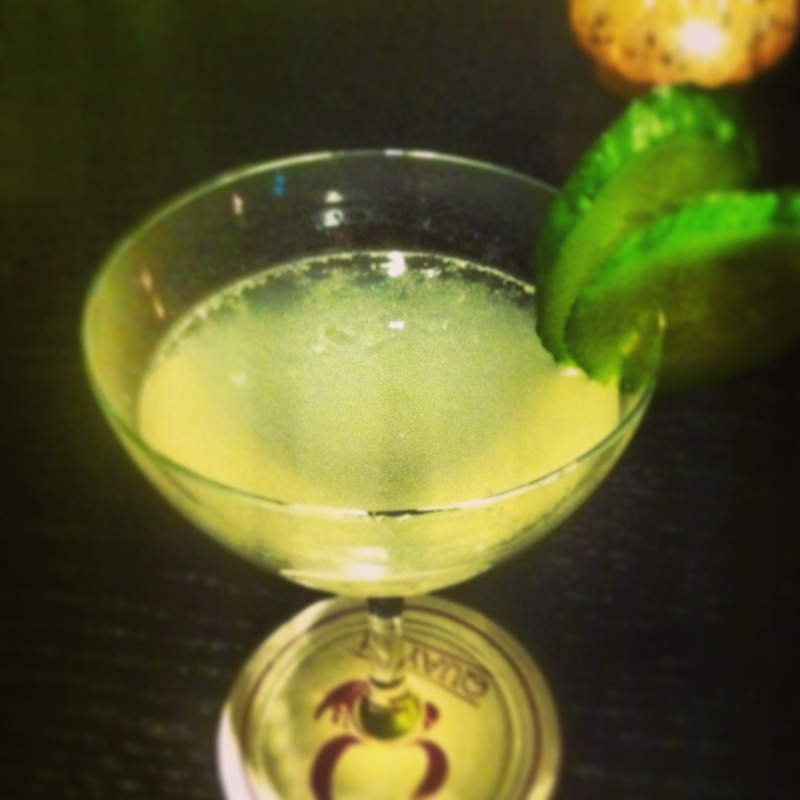 We had heard whisperings that there was some good food to be had at Yum Yum by Hugo Coudurier at the K108 Hotel. So a group of 5 of us headed for dinner on a night recently. The Hotel is deceptive from the outside, its interior is very different to what you would expect. Upon entering the restaurant, albeit at an earlyish time, it was empty. I live my life by one main rule: Beware an empty restaurant. Soon though, other tables began to fill up and by the time we got to the menus and bread (very tasty, in particular a focaccia style creation) my fears were quickly being allayed. The restaurant itself is a large space, whitewashed walls and is quite cosy given its size. I started with some grilled vegetables served with discs of Haloumi. It was a very pleasant way to start the meal, well cooked veg, tangy sauce and a well dressed salad. Another had the pea soup with shrimp. This was unfair on the crustacean in question, it was somewhere between a prawn and a lobster when served. Leaving said diner very content. Another notable starter for its presentation alone was the ravioli, slightly under perhaps, but that was the only niggle for what was a very pretty and tasty dish. For my main I went for sea-bass, in a (I forget the name of the sauce) sauce served with risotto and crispy onions. The fish was cooked nicely, and there was a richness to the sauce and risotto. The crispy onions added a wonderful crunch. I would have liked something a little zingy perhaps for contrast, but it was still a delicious dish. Another main of note was the burger, which was off the menu, but apparently is a favourite at this place. It was munched very happily by said diner. Few opted for dessert, I was one of the brave souls who did. A well presented lemon tart was happily eaten. You are going to have to take my word for this- as the lighting was perfect for dining, awful for food photography. Thankfully. My darling sibling went for a chocolate fondant, which I didn’t get to taste, which would lead me to believe she enjoyed it. Throughout service was brilliant. Not overly formal as often can be the case in Doha and our waiter was happy to suggest dishes along the way. He was very attentive and yet you barely noticed him. I was a guest at dinner (Thanks again), but the menu is very reasonably priced for the food and service you receive. Definitely one of the best places in Doha.